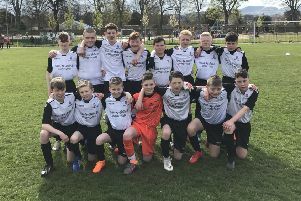 Gala Fairydean Rovers Under-13s came back from 3-0 down at Drum Park to knock Edinburgh South out of the Edinburgh Cup in the semi-final. Edinburgh were quick to make their presence known. They overran Gala’s midfield and soon had the ball in the back of the net. Ben McManus ran onto a throw, down the line and nicked the ball away from the keeper before rolling it into the far side of the net. The towering figure of Momodou Sambu added Edinburgh’s second of the game from a corner six minutes into the second half. Adem Dursun made it 3-0 for Edinburgh as his shot from the edge of the box snuck in under the crossbar. Edinburgh looked increasingly assured as the match progressed but missed a few golden opportunities to extend their lead that they would later rue. Harris Fairgrieve chipped the keeper to start Gala’s fightback with just over 10 minutes left to play, then a free-kick was whipped into the box and it was met at the near post by Fraser Swan who dutifully tapped in. With two minutes to go Gala completed their remarkable turn around as Evan Beattie found the net with a speculative effort from out wide on the right side of the pitch. With the score tied three a piece, next came extra time. There were few clear-cut chances in the following half-hour with the exception of a penalty awarded to Edinburgh. However, this was saved emphatically by Cameron Forster. The resultant penalty shoot-out was tense with both keepers making a number of saves, but after seven penalties for each team, Gala came out 3-2 victors with Ewan McLaren, Swan and Oliver Czerwinski scoring for the winning side. • Musselburgh Young Stars Under-16s beat Eyemouth United 3-2 after extra time in the second round of the Division 2 League Cup. Eyemouth had the lead going into half time, but a calmly converted penalty by Blaine Ferguson in the second half levelled the score. Musselburgh then took the lead through an Andrew Eunson strike, but Eyemouth equalised minutes before the final whistle to take the score to 2-2. As extra time neared an end, it looked as if the match would go to penalties. However, Eunson popped up again to seal the win for the home team. With a biting northerly wind blowing directly across the pitch, Longniddry Villa Colts U-15s welcomed Leith Athletic Colts to Longniddry Park for the quarter-final of the Division 3 League Cup. Longniddry were the quicker team to settle with the central duo of Ross Montgomery and Michael Whiteoak controlling the game from midfield. Pacey Leith striker Mathew Fiskin kept the Longniddry defence on their toes, but it was only a matter of time before Longniddry took the lead. The opener came in unlikely fashion after 25 minutes when a corner taken by Taylor Grigg got caught in the wind, evaded everyone and dropped into the net at the back post. After 51 minutes played the second goal came, again from a Taylor Grigg corner. A deep ball to the back post was met with a powerful header from James Lithgow that flashed into the net. Longniddry were tested a few times in the final ten minutes, but they were able to hold onto a 2-0 win.